Is Heel Pain the Reason My Knee and Hip Hurt? What is the accessory navicular bone? An accessory navicular bone is an extra bone or piece of cartilage located in the middle of the foot near the navicular bone, the bone that goes across the foot near the instep. It is present from birth (congenital) and is a common trait. There are three types of accessory navicular bone, differentiated by location, size, and tissues involved (bone and/or cartilage). Although some people with an accessory navicular bone never develop symptoms, a bump can develop in the affected region that can lead to irritation, swelling, and pain. This painful condition is sometimes referred to as “accessory navicular syndrome”. If symptoms occur, treatment may include immobilizing the foot with a cast or removable boot; ice; physical therapy; and orthotic devices, such as arch support. What causes accessory navicular bone? An accessory navicular bone is typically considered to be a developmental abnormality present from birth (congenital). Research involving large studies of families of individuals with accessory navicular bone suggests a genetic influence with possible autosomal dominant inheritance. The exact cause of accessory navicular bone is unknown; however, it may be related to an incomplete joining (fusion) of bones and connective tissue during development and/or an abnormal separation of affected bones and connective tissue. 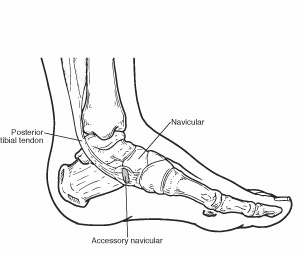 What are the signs and symptoms of an accessory navicular bone? While some individuals with an accessory navicular bone never experience symptoms, others can develop a painful condition, sometimes referred to as the accessory navicular syndrome. This occurs when the bone and/or connective tissue are aggravated. This can be caused by injury to the affected region, chronic irritation from shoes or other sources, and excessive activity or overuse. Symptoms of accessory navicular syndrome usually occur around adolescence and may include the development of a painful, red or swollen bump on the midfoot (inner side of the foot above the arch). How might accessory navicular bone be treated? If the accessory navicular bone is causing symptoms, activities may be restricted and a softer shoe may be recommended until the symptoms go away. If the symptoms persist, a specially and carefully made shoe support may be tried. For people with an accessory navicular bone who experience severe symptoms, surgery may be considered to remove the bony growth. Other treatments may include medications such as nonsteroidal anti-inflammatories (NSAIDs), immobilizing the area with a cast or boot, and physical therapy. Why Do My Feet Look Purple?